Designed for plug and record operation with fully self-configuring digital operation, the AVX Camera-Mountable Lavalier Digital Wireless Set from Sennheiser is well suited for film and video production, as well as electronic news gathering (ENG) and A/V rental houses. The system consists of the EKP receiver, SK bodypack transmitter, and an ME2 lavalier microphone. The AVX system provides a variety of automatic functionality aimed at flexibility and speed including auto-dynamic range settings, which automatically adjusts the audio level to a recording device's input sensitivity, reducing distortion and eliminating the need to adjust your mic's level. The system also offers link protection, a feature that quickly scans available frequencies and will automatically switch before any interference becomes audible. The EKP receiver has a compact design that plugs directly into the XLR input on your camera or recording device and includes the necessary adapters for use with DSLR cameras. Additionally, the EKP can swivel, allowing it to be used with other attachments mounted to a camera. It powers on and off automatically when it senses 48V from your recording destination, for fast recording and saving battery life when not in use. The Sennheiser ME 2 is an omnidirectional, sub-miniature clip-on lavalier microphone designed for speech and vocal applications. It can be used with the Evolution and AVX Series wireless transmitters. 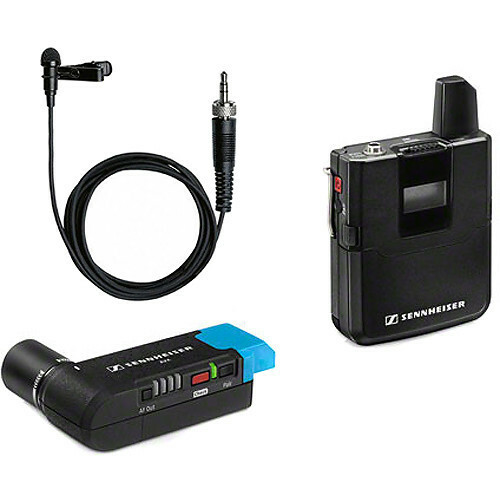 Designed in collaboration with creative professionals for film and electronic news gathering (ENG) applications, the Sennheiser AVX Digital Bodypack Transmitter (CH 8: 1920 to 1930 MHz) features an innovative design that is fully self-configuring which makes setup fast and easy. The system's link protection helps ensure reliable audio transmission and the AES 256 encryption helps protect your signal from unauthorized interception. The bodypack transmitter features a 3.5mm jack and accepts either a microphone with a maximum input of 2.2V RMS (50 to 20,000 Hz response) or a line level source with a maximum input of 3.3V RMS (20 to 20,000 Hz response) for a wide variety of sources. The unit is powered by an optional Li-ion 3.7V battery and has an operating time of 15 hours. Designed in collaboration with creative professionals for film and electronic news gathering (ENG) applications, the Sennheiser AVX EKP Camera Plug-On Digital Wireless Receiver features an innovative pivoting design for attaching to a video camera's XLR microphone input without getting in the way of other camera accessories. The receiver rotates both clockwise and counter clockwise. It will click into place as opposed to a tension based design. The digital receiver is fully self-configuring which makes setup fast and easy, while the system's link protection helps ensure reliable audio transmission. The unit will switch on and off automatically with the +48V phantom power from the camera to save battery power. It will automatically match the camera's input sensitivity without having to adjust the audio level on the wireless microphone. The receiver comes equipped with a set of accessories for operation with DSLR cameras including a BA 20 Energy Pack, a light shoe mount, an XLR to 3.5mm adapter for use with DSLRs, a belt clip, a USB cable, and a USB charger.